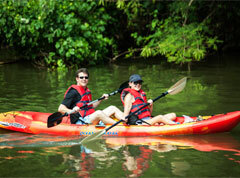 Grab a friend and jump in a two person Kayak to explore two of Guam's exotic tropical rivers up close. 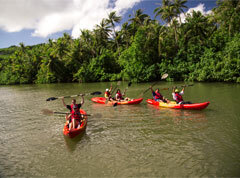 Have hands on experience with local wildlife while learning about the culture and history of Guam. Our friendly tour guides will make your experience safe and fun! 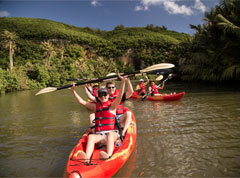 Kayaking on Guam is an adventure you won't want to miss! 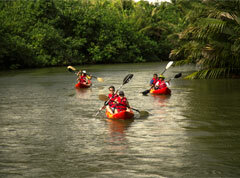 Paddle up Talofofo River, see crabs and fish, learn about life around the river. After Talofofo River, enter Ugum River to see natural spring water. Then proceed to an ancient village and see Latte Stone, over 1,500 years old. Learn some basket weaving and ancient Chamorro culture. 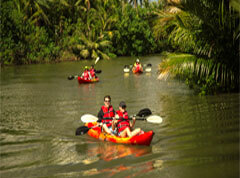 Transportation from & to hotel, Guide, Kayak rental, life vest, cold drink & lunch. 5.5hours including hotel pickup or 4.0 hours without hotel pickup. One (1) TC is Free for every 15 paid customers. 12 years old and over. Comfortable walking shoes or sandals & casual attire. Camera, hat or cap, towel & sunglasses. $15 Professional photograph while Kayaking. You'll be able to pick up the photo at lunch time. Caregiver must accompany handicapped person. Remarks: Neither the bus nor the boat has a wheelchair lift. 50% penalty of the NET Tour Price if cancelled after 17:00 one (1) day prior to the tour date. We are highly recommended in TripAdvisor. Click here to read honest reviews. © Copyright, All Rights Reserved. Website and Booking Engine by GuamWEBZ.